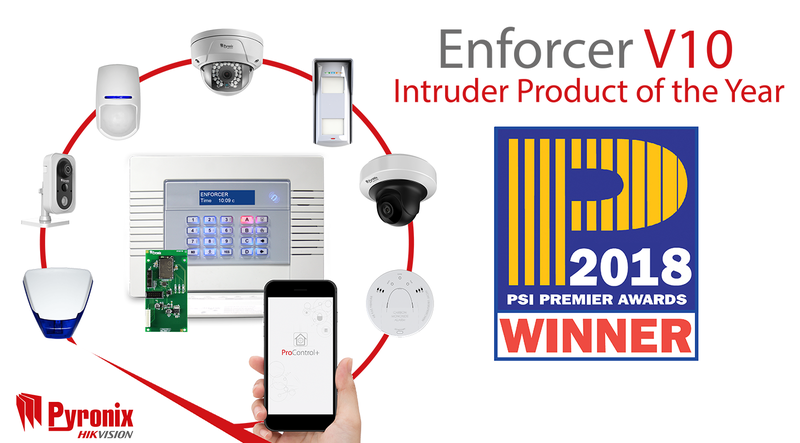 ASH Security are delighted that the Enforcer by Pyronix has won the PSI Intruder Product of the Year for the second year in a row. Voted for by industry professionals, the total Wi-Fi solution has once again proven to be the best in its class and ASH Security are proud to be a registered installer of this award winning product. “To win the Intruder Product of the Year is a great accolade, but to have won it two years consecutively is such a fantastic achievement and we are extremely pleased that the Enforcer has been recognised by the installers who voted again,” Laurence Kenny, Pyronix Marketing Manager, said. Since winning the award in 2017, many developments have been made, including the addition of the brand-new ProControl+ smart device application, HD Wi-Fi cameras and Hikvision integration. These releases have once again added to the value of the Enforcer; allowing installers to extend their offerings, compete in new markets, remain competitive and provide new and desired solutions to end users in a converging industry. “Everything we do is with quality, innovation and customer satisfaction in mind, so to have delivered a solution that wins the award in 2017 itself was a great honour,” Laurence said. He continues: “After winning the award it was important that we didn’t get complacent and used it as motivation to continue to innovate and develop. “Looking at the converging market and listening to installer needs, we added to the Wi-Fi solution with Full-HD video integration, a better app with improved UX, as well as compatibility with Hikvision video products. “Having delivered this, to be voted the professional choice once again really is a testament to how dedicated we are to providing the best possible solutions, as well as the entire Pyronix team for all their hard work and commitment.